From the perspective of the Romans, you play as Marcus Aurelius, the last of the "Five Good Emperors" who governed the Roman Empire from 96 to 180 (see you've learnt something already!). Following the video footage that introduces you to the campaign I set out on a practice mission, which enables you to get to grip with the control system and user interface. The first mission involved threatening some local farmers into paying their taxes by killing 50 of them until the rest decide to leg-it and pay up, but as you move through the 14 campaign missions and 100 of the most important battles of the time, the action becomes more frantic and the missions become more important in securing the future stability of Rome; the idea is to extend the influence of Rome by winning these battles and capturing regions. Each battle begins with an introduction of the mission, a run down of the terrain you'll be fighting over, and a few tips on how to use the terrain to your advantage – more about that in a second. Then, you enter the army camp where you can upgrade and recruit new squads (units), buy weapons, and heal wounded soldiers. As you progress through the missions you gain fame and money as the influence of Rome extends. This money can then be spent in your army barracks on recruiting or upgraded these troops. In the final version there will apparently be twelve troop types, ranging from cavalry to heavy infantry, all of which have their own strengths and weaknesses in battle. Once you finish choosing your troops and upgrading where necessary, you'll enter the battle where you first need to form a battle-line. There's no time limit here, so you can ponder over the best tactics to defeat your opponents, whose position on the battlefield is also shown on the screen. The main challenge that you'll face is deciding on how to use the terrain to your advantage to tackle these enemies. 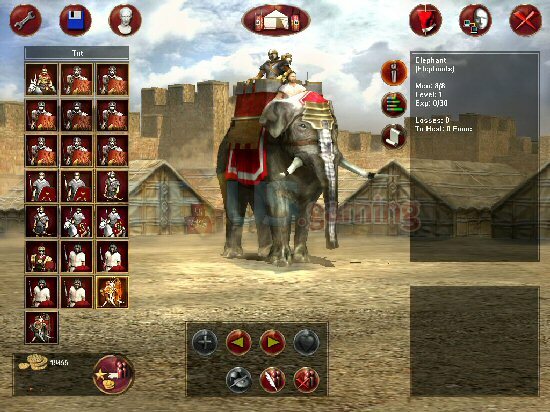 For example: In the battle where you need to defeat the rebels of Latium (they're seeking independence from Roman control) you'll be faced with rough terrain on the left hand side of the map and open ground on the right. Rough terrain will hinders your cavalry, who are more suited to open ground, but light infantry are comfortable moving through these sections. So, you need to move each unit of troops to a starting position on the battlefield and issue orders via the user interface prior to the battle, such as directing them in which direction to head. The example I've given for the terrain in this particular battle is an extremely simple scenario; I sent my cavalry and heavy infantry across open ground and the light infantry through the rough terrain, flanking them from the left hand side and beating them with ease. But, as you progress through the campaign the terrain severely effects the battle conditions, with mountainous regions(ideal for archers), and a mix of different terrains on the same battlefield, meaning that you'll spend more and more time planning your starting tactics. The interface for choosing these orders works well enough, but it's still hampered and restricted by the PS2 controller; throughout my time playing this preview code I was gagging to play the PC version.